I wasn’t sure I would post this, but have to get it off my chest. You may have noticed that I haven’t posted in a while. It’s been a difficult summer. On June 20, we lost our last horse. He was 30, and had some health issues, but it was still unexpected and we were in shock. My father, who had worked on July 8, became suddenly ill at 3AM and called 911. After many tests, he was diagnosed with stage 4 cancer. 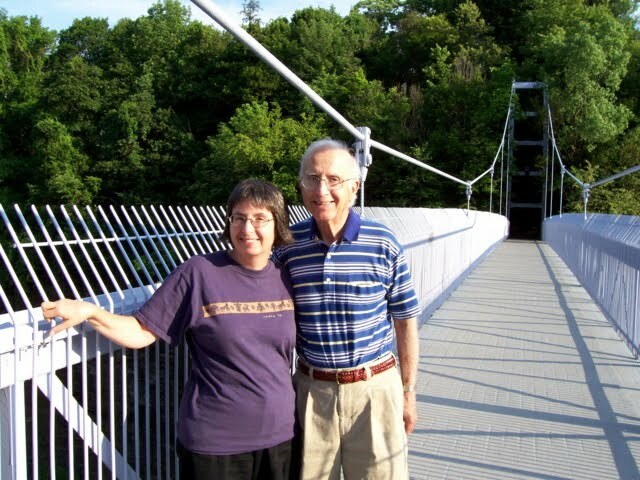 I was able to travel to upstate New York (600 miles away) see my folks on two occasions this summer. During the second trip, my father’s condition suddenly worsened and we lost him on August 22. So the last few months have been a whirlwind (or maelstrom) of shock, grief, disbelief, extreme worry and sadness. So I won’t share all the details, but will mention a few things. When we told people about his passing, grown men would break down. People I had never met were sobbing as they shook our hands at the wake. So many told us about their interactions with our father–how much he helped them, how he brightened their day with his jokes and funny stories, how they always looked forward to seeing him. I knew he was very generous in his dealings with people–he did a lot for what he charged, not at all like the stereotype of lawyer jokes. But I had no idea how much until the wake–it was a rainy evening, in the summertime, when a lot of people we knew were out of town. Still, the line extended out the door and we shook hands with visitors for four hours. People have asked me how I am able to function so well. I don’t, much of the time. But, if I appear to, it’s for two reasons–it’s still pretty unreal, and Dad was never one to dwell on unhappy events or thoughts. He kept telling me, “I don’t want ‘my situation’ to interfere with your work.” When I feel down, I remind myself of that. Still, there are so many questions–How could this happen to such a kind and generous man? How could this horrible process be going on inside him and no one know? He devoted his life to taking care of his family and, after we moved away, our mother. Why did this happen now, when his garden, his pride and joy, was flourishing (unlike most gardens in the area, and ours in North Carolina)? He never got to see it or to taste his tomatoes and cucumbers. Did Dad know he was unwell, but didn’t want to worry us? Could we have done more? Some things we are not meant to understand. We met so many amazing people on this journey. The compassionate and tireless nurses, staff and residents at Wilson Hospital, Woodland Manor, and Bridgewater Center. I spent the night there–Dad’s last night. He was not able to speak, but could communicate through hand squeezes for a while and, after that, eyebrow movements. A couple of nurses told me what I would see and, when I described other changes, assured me that these are part of the process of dying. It was surreal to be told, “That’s natural” or “That’s ok,” but the last thing Dad would have wanted was to suffer. I’m glad that Dad got to enjoy life until very close to the end. And I’m glad my mother is safe and doing well, despite many recent changes. Thank you to everyone who told us “Ted stories,” who were so kind to my family, and who continue to visit my mother. I’m almost afraid to mention names, for fear of leaving someone out. But I have to say, we cannot thank Aunt Elvira and Uncle Sam enough, as well as Aunt Jennie, cousins Marilyn and Ron, Judy, Anita, Uncle Gino, my parents neighbors, Dad’s colleague Charlie Collison….the list goes on. Thank you to Pucedo’s Funeral Home, who so gently helped us through this experience. 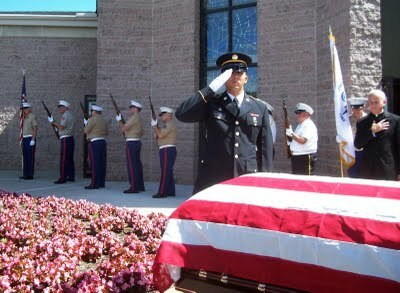 Thank you to John and Donna, who arranged for a 21-gun salute, to help send Dad on to his Next Life. We’ve been so fortunate to have been spared the experience of losing a parent until now. To those of you who have been through it, I realize that when I’ve said “I’m sorry for your loss,” I really didn’t appreciate the depth of the phrase until now. A 21-Gun Salute–a most touching and beautiful ceremony. Veterans and soldiers from 5 wars participated. Father Joe is on the right. (Dad served in the Air Corps in World War II–before we had an Air Force! ).